Brooklyn Rosen had high moral principles and was raised properly. Married for over fifteen years, those standards went out the window along with her fidelity when she met Bo. After becoming a self-proclaimed home wrecker, Brooklyn left behind her marital home, along with the damage caused by her emotional wrecking ball. But the whispered remarks followed. 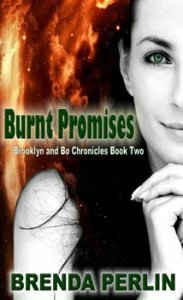 In “Burnt Promises” (Brooklyn and Bo Chronicles: Book Two) we learn what shaped Brooklyn, the trials of an unhappy marriage and a deep abiding love that would not be denied. We meet a troubled, spiteful wife, who does not want to become an “ex”. This book is available from Amazon US, Amazon UK, and Amazon Everywhere. Originally the book series was called Home Wrecker but many people complained after reading the two stories that they didn’t feel I was being fair to myself by calling it Home Wrecker. Burnt Promises suits the story better. There were promises that were not kept. Well, since this story is based on my life, I will have to say the main character Brooklyn. She has made mistakes but she has also been tested to her limits and has proven to be true survivor. I do like to think there is a moral to this story and that would be learning to be more compassionate towards people while trying to be less judgmental. That I am a real person and willing to be open and vulnerable. Sometimes we make mistakes because we are human but it is how we chose to deal with those mistakes is what matters most. Even though people may never have to experience such events as “Brooklyn” has, most people can relate on some level or another. This book gives pause for thought about human nature and how we deal with problems. I found it completely addictive. This is an exceptional book which grips the emotions. A definite must read worthy of five stars.